In case you didn’t know, winter is not, I repeat: not, my favourite time of the year. I crave brightness and warmth, beaches and forest hikes amidst sun drenched foliage, weather worthy of serious summery picnicking. Alas I do like a hot beverage, and rarely are they as satisfying as on a cold wintry day (except every morning, when I’m capable of anything to get some caffeine pumping through these here veins, but that’s a whole different story). Apple cider isn’t something that’s available in the UK, a tragedy in so many ways, and something I miss from my American youth. 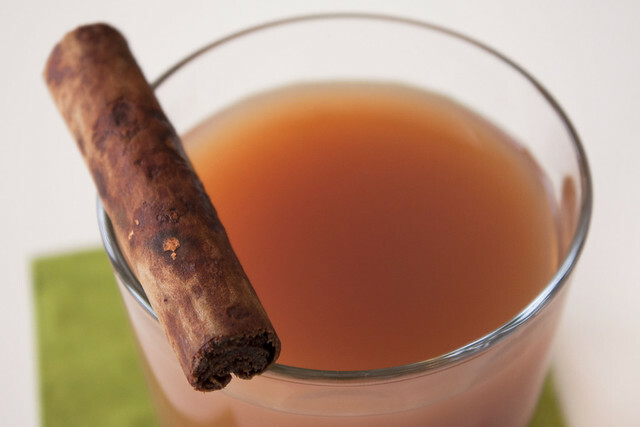 This spiced apple drink has been my solution, despite its not really coming close to that beloved beverage, and it’s something I’ve been drinking every winter since moving to England nearly ten years ago. This is simple: just add all of the ingredients to a saucepan and bring to the boil. Once the bubbles start, immediately turn the heat down to a low simmer, cover, and leave for 20-25 minutes. Strain the juice to remove the spices and serve hot. Mmm sounds yumm!! Definately going to try this!